Wire-wound and thin-film resistors are widely used in industrial thermometers. It is important to choose a temperature device with the appropriate material, design, and configuration that meet requirements and comply with the DIN EN 60751 standard for resistance thermometers. A resistance thermometer uses a sensor whose electrical resistance varies with the temperature. The materials used for the sensors in resistance thermometers – also called RTDs, or resistance temperature detectors – have a positive temperature coefficient, which means the electrical resistance of the sensor increases as the temperature rises. The right material, design, and configuration make a positive difference in the performance and lifespan of an industrial resistance thermometer. It is also important to compare specifications for accuracy and vibration resistance with the DIN EN 60751 standard. Although copper or nickel can be used, the wires in most industrial resistance thermometers today are made of platinum, a metal with very stable resistance over a wide temperature range. RTDs with a Pt100 sensor have a nominal electrical resistance of 100Ω at 0°C. Those with a Pt1000 sensor have a nominal electrical resistance of 1000Ω at 0°C. Pt100 sensors are cost-effective and the ones most commonly used worldwide. Pt1000 sensors are more expensive, but they have a larger resistance-to-temperature change, which results in better resolution. Other advantages of Pt1000 sensors: They reduce the effect of lead wire resistance and have a longer battery life. In a wire-wound (W) resistor, a thin platinum wire is either fused inside a glass body or spiral-bound inside the cylindrical cavity of a ceramic protective body. W glass resistors are highly resistant to vibrations. However, high temperatures change some of the properties of the glass, which, in turn, decrease accuracy. Manufacturing W glass resistors is relatively difficult and expensive. W ceramic resistors provide a much broader operating temperature range (–196 to +600°C) than W glass resistors, but the spiral-bound wire is prone to breakage when subject to high vibrations. In thin-film (TF) resistors, a fine film of platinum is deposited onto a ceramic plate. The film, plate, and wire connectors are then sealed with a glass layer. TF resistors are very small, resist vibration well, and are very affordable. However, the different materials in each resistor (platinum film, ceramic plate, and glass layer) limit the resistors operating temperature ranges to –50 and +500°C. Special TF elements have wider temperature ranges but are more expensive. The basic 2-wire connection is the simplest configuration. It is also the least accurate, as the internal lead resistance of the wires is added to the measured value. This configuration is not recommended for Pt100 measuring circuits when class AA or class A tolerance is required. But when combined with a PT1000 sensor, a 2-wire configuration becomes more accurate because the sensor’s higher resistance decreases the relative effects of the connecting cables. In a 3-wire configuration, the third wire is used to assess and compensate for the resistance of the connecting cables. A 4-wire configuration not only eliminates the effects of the connecting cables’ resistance, but also compensates for any asymmetries in the cables. A 4-wire configuration allows the longest cable length with the smallest error rate. WIKA manufactures a broad range of RTDs with platinum resistors that meet or exceed DIN EN 60751 requirements. 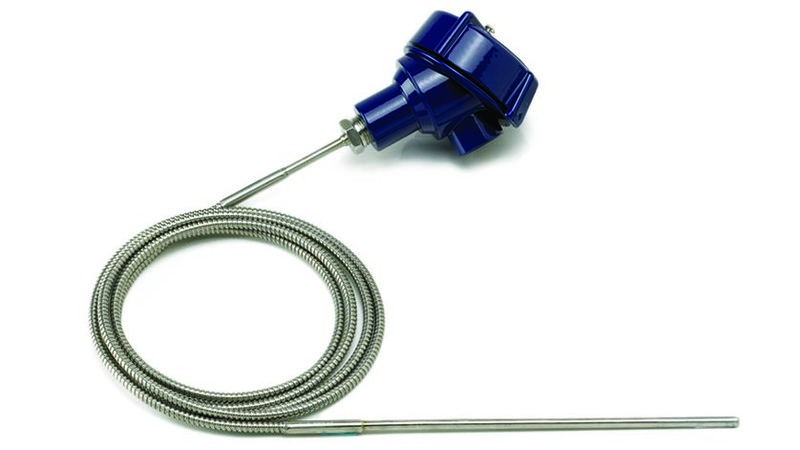 WIKA’s resistance thermometers can be integrated or mounted in a thermowell, or used with direct process connections. Contact WIKA’s temperature measurement experts for more information about industrial thermometers and to find the right ones for your applications.